A BBC News article exploring the fate of England's lost football grounds last week drew an overwhelming response from readers and on social media. Here we look at some of the other clubs whose former stadiums are gone but certainly not forgotten. Manchester City: Maine Road. Closed in 2003. When Manchester City left Maine Road in the city's Moss Side area in 2003, taxi driver Gaz Stevenson decided to take a bit of the old ground back with him. He said: "I walked across the pitch and where Shaun Goater scored in the 3-1 win for City in the last derby at Maine Road. I stood just on the edge of the six-yard box. "It was just a very strange feeling to walk in and out of the stands. Some seats had been ripped up… A few builders weren't doing too much… We took it all in. "I went to my seat… my seat in the North Stand behind the goal. It was all bagged up for me… I got it bolted in the shed in the garden. You can go and sit on it." He had bought his old seat online for £12.50. Homes were built at the famous old ground with its wide pitch, but Mr Stevenson, 32, still has a family connection there. Gibson's Green, a "big circle of grass where the centre circle was", is named after his great-great uncle, long-serving head groundsman Stan Gibson. He said: "Stan was a real big character. Mike Summerbee, at the opening of Gibson's Green, said Stan was one of the main reasons he signed for City. "He came to see the club… [and] Stan really sold the club to him." His father, Geoff, 59, was also a groundsman in the 1970s, "lucky enough to be at the big dinner in Manchester" after City won the 1976 League Cup. The stands were of different heights, but Mr Stevenson, from Stockport, remembered a "fantastic" atmosphere. He said: "Maybe to most away fans they'd think 'who built this?' The main stand with its strange-looking roof, there were gaps in two corners. "But it added to the character of the place. For many years we had very good wingers. A lot of wingers talked about the encouragement they got from the Kippax [stand]." Sunderland: Roker Park. Closed in 1997. When Paul Dobson started going to Sunderland games in the 1960s he paid "three shillings on the bus and three shillings to get in". He remembers the ground's famous "Roker Roar" when "the place just rumbled". He said: "[Against Stoke] I got squashed... and I didn't quite pass out but people were trying to push me into the air over people's heads to get you to a space to recover. "It was always a cold place with the wind coming off the North Sea and when they took the big part of the Roker End [open terrace] away, they reduced the capacity and it made it much colder." He said he "couldn't bring himself" to go to an auction of Roker Park items so a friend bought some turf for him and he later acquired two seats. After Sunderland's 1973 FA Cup triumph, the club played in the European Cup Winners' Cup. Expecting "huge queues for tickets" for a clash with Vasas Budapest, Mr Dobson walked to Roker Park from his Bishop Auckland home to get one. He said: "There was nobody else there about two in the morning so I climbed over the wall and slept on the manager's bench." Mr Dobson has never returned to the old ground, now a housing estate. The streets have names such as Roker Park Close, Midfield Drive, Goalmouth Close and Promotion Close. Perhaps in a reference to recent Premier League form, Mr Dobson said: "More like Relegation Street." Hull City: Boothferry Park. Closed in 2002. Fans of Premier League Hull City have seen huge changes in more ways than one - they were playing in the Football League basement, Division Three, when they left Boothferry Park before being promoted two years later. "The stadium is a housing estate now, but it was left abandoned for years," said Ian Farrow, 53, a supporter since 1966. "You gradually saw the grass and plants grow taller than sections of the stands. It was the saddest thing to see it deteriorate and be abandoned. "We had six floodlights and those and the stands were there for about five years after we moved to the new stadium." "It was dilapidated by the end, the toilets didn't work and you had to queue in the rain for coffee. "When the ball hit the stand roofs, you were covered in rusty water, but it was our home. "The last match we lost 1-0 to Darlington and it was a horrible miserable day so we just left as quickly as possible. "In the end [the move to the KC Stadium was probably for the best." Derby County: The Baseball Ground. Closed in 1997. John Hemsworth, 58, from Leicestershire, paid £61 at an online auction for one of the Baseball Ground's old turnstiles - but has since paid about £200 to have it painted and refurbished. "I first went to the ground in 1967 and it was originally built as a baseball ground and was known as an intimidating place for visiting teams, with the pitch often ankle deep in mud," he said. Mr Hemsworth remembers the game between Derby and Manchester City in 1977 - famously featured on Match of the Day - when the pitch was so muddy a groundsman had to measure and repaint the penalty spot halfway through the match. "The way the stands were built you were as close to the pitch in the upper tier as you were in the bottom," Mr Hemsworth added. "If you were on the terraces you could touch the players, it was extremely close to the pitch." 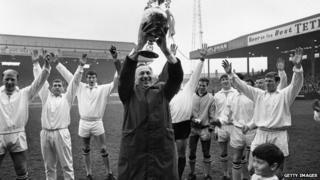 Brian Clough guided the club to the League Championship in 1972, but when a row with directors forced his resignation a year later, there were protest marches in Derby. "I was still at the end of my school days... Winning the league title, playing in Europe, you just think it's like that all the time as a kid. "Allegedly when we played a European Cup tie... he [Clough] got the fire brigade out to water the pitch to make it a bit more sludgy. "He still had his green jumpers on.... [his] trademark." When Mr Hemsworth collected the turnstile from the ground he said "there were weeds growing out of terraces and a tree growing near the entrance, it was quite sad to see it like that". Now the ground is another housing estate. His wife, Lynn Hemsworth, 53, said: "I've chosen not to go back to the old stadium... some people did and it's tarnished their memories." Millwall: The Den. Closed in 1993. The New Den, the first new all-seater stadium to be completed after the Taylor report on the Hillsborough disaster, is about a quarter of a mile away from the old Den in south-east London. The old ground was known for its intimidating atmosphere as the club's fans developed a fearsome reputation for hooliganism. But Dave Hart, 65, from New Cross, London, said while violence at the ground in the 1960s and 1970s was "very common" it was similar to "most grounds" at the time. "Millwall fans were not always innocent parties but there is always two sides to every story, fans at the time became more like a family and closed ranks to fight the bigger enemy. "Millwall became the whipping boy of the media, police forces, the FA and even the government at the time." "I started going to matches aged nine with my father and brother back in 1958. "Match day was the be-all-and-end-all, all the family used to come down." "The very last day [at the old Den] was very emotional. The old ground was dilapidated but had character and it was part of you." "The ground at the new stadium is quite sanitised, there's still an atmosphere, but the old Den was just a completely different place. There's no comparison." "At least six pubs have since closed in the local area since the stadium shut." A plaque has been erected in the housing estate where the main gates to the old stadium used to stand, he said. "I am proud to call myself a Millwall fan and proud of its history," he added. Brighton & Hove Albion: The Goldstone Ground. Closed in 1997. While many clubs' moves have seen them leave behind a run-down home for a shiny new stadium, Brighton's departure from the Goldstone Ground threatened the very existence of the club. The Seagulls' then owner sold the ground to a retail developer without lining up a replacement ground, much to the fury of fans. The fact the team, who had reached the top division and the FA Cup final in the 1980s were, less than 15 years later, struggling at the bottom of the fourth tier and fighting relegation from the league, made the picture all the more gloomy. Brighton played 60 miles away at Gillingham's Priestfield Stadium for two years, which fan Alastair Watts said was an "horrendous journey and a soulless" location. The 68-year-old said he only watched the team at Gillingham twice, because it was an "awful situation" and "no-one knew where we would end up, some people thought the club would collapse". Mr Watts said it was "difficult to create enthusiasm" and more fans attended the away games than attended many of the home games at that time. "In my will I requested my ashes to be scattered around the south goal [at the Goldstone], but now I honestly don't know what will happen to them," said Mr Watts. Although he now lives in High Wycombe, he has been a Brighton fan for decades and can remember his dad taking him to the Goldstone Ground when he was seven years old. "In the 1970s and early 1980s I had a season ticket in the old south stand. It was a wooden construction and on two occasions caught fire - almost certainly caused by fallen cigarettes. "The game continued, you just ignored it and hoped for the best, but the smoke was coming up through the boards. "Staff got in underneath the stand and used a hose to put it out. "Finally, of course, it did catch fire properly, but when the ground was unoccupied. Years later, when I saw the Bradford fire, I realised just how lucky we'd been." Despite the toilets being "spectacularly disgusting" and food stalls "well worth avoiding, the atmosphere and the experiences were well worth remembering", he said. After the unpopular sojourn in Gillingham, the Seagulls returned to Brighton, to play at the Withdean Stadium, an athletics arena, from 1999-2011, before finally moving to a home of their own - the Amex Stadium in Brighton. But Mr Watts said no longer being at the Goldstone was "absolutely heartbreaking", adding: "I was prepared for the ups and down of football but not moving." What happened to England's lost football grounds?